Bethlehem village owes its development to its tourist business. Situated on a high plateau its invigorating mountain air, pure water and agreeable summer temperature made it an ideal vacation land. The first to take note of this was Governor Henry Howard of Rhode Island. The cottage colony first started with the building of a summer cottage on Main street, in 1873, nearly opposite the Howard House for Gov. Howard and known as the “Buckeye,” where he made his summer home. As time went on, more and more summer visitors realized that Bethlehem was far superior to other resorts and the cottage colony began to grow. About the same time, Mr. Knight built three more cottages at the west end and rented them to summer visitors. One of them, “Cloud View,” was at one time occupied by Will Carleton, the poet. 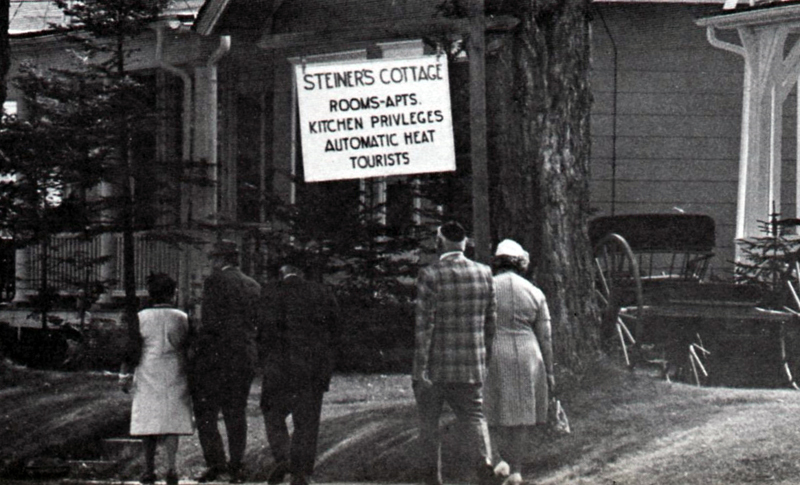 This cottage was sold in 1940 to Mr. Reginald Buckler, once the operator of the Columbia and Alpine Hotels. At one time Mr. Buckler was editor of “Above the Clouds,” a newspaper printed atop Mt. Washington. At this time, Mr. Sayer decided to build cottages to rent so he bought a large lot of land near the Arlington and built two cottages. He then bought a lot of land east of these and built two more in the colonial style. These last two are now the Pine Manor apartments owned by Richard Coney. Soon “The Gables” was built for Mrs. W. H. Kelner on the corner of Main street and Park avenue. John Ware Esq. of Waterville, Maine, banker, and director of the Maine Central Railroad, built a fine cottage on Congress Avenue. In 1894, Mr. Theodore Thomas, the eminent musical conductor of the Chicago Symphony Orchestra, bought twelve acres of land on the Whitcomb farm on the road to Franconia, and in 1896 began the building of “Felsengarten,” his summer home for many years. Paul Rehnborg of Connecticut, the noted jeweler, purchased the Jesseman place on Prospect road and made great improvements. George Abby built a fine house on Berkeley street. About 1905,Mr. Macbeth of Pittsburgh, Pa., purchased the Phillips farm on Prospect road. Arthur Malcolm of Philadelphia purchased the Brown property on Pleasant street and built a large addition. E. L. Merrow of Pinehurst, N. C., photo­grapher, built on Maple street in 1906. In 1908, Morgan, the contractor, built the Dr. J. W. Kenney cottage located just west of the Maplewood property, the beautiful house of Mr. Alvin E. Ivie of New York City, just east of the Turner cottage, and the Beaumont cottage situated on Park avenue, just below the Mount Washington House. Others to build in the ten years prior to 1908, were, Mr. J. C. Harris, at the Maplewood, Gen. George T. Cruft, at the Maplewood, Mrs. E.M.W.Smith, Main street, west of Turner cottage, Mr. Arthur Dexter, at the summit of Agassiz Hill, Mrs.J.S. Fitch, Maple street, Mrs. Margaret Gachus, Maplestreet, Miss Kate Brinkerhoff , Maple street, Mrs. E. K . English, Pleasant street, Mrs. Ruel W. Poor, Berkeley avenue, Mr.J.E.Skilton, Lewis Hill road, Mrs. Charles J. Picquet, Lewis Hill road, Miss Louise Foster, on Lewis Hill and Mr. J. J. Glessner of Chicago, “The Rocks,” on the Bethlehem-Littleton road. Soon after 1908, A. A. Pennock of Littleton built cottages for Mr. Ricky and Mr. Westfall, just east of the Ivie cottage. About the same time, Waldo Whitcomb built two cottages for Mr. Lemen south of the Arlington Hotel, a short distance from L. M. Knight’s residence . Mr. Arthur Zinn bought the Macbeth property, Mr. Somerville built a cottage on Strawberry Hill street and A. D. Locke built “Lone Larch” on Lewis Hill in 1919. This house has long been one of the out­ standing summer estates. The main residence is built largely of field stone and features a living-room 48 by 23 feet paneled in western pine with a great stone fireplace. From the open porch, one has a panoramic view of the mountains extending from Cannon Mountain to the south, past the Presidential Range to the northern peaks and the Vermont hills. Two more show places are the magnificent house built for Dr. Shaw by Mr.Glover, situated on the road leading from Agassiz hill to Franconia, and the Frank Estate built in 1924, halfway between Bethlehem and the Maplewood, costing $127,000 to build. Two more cottages worth mentioning are the Dr. Jeffry cottage on Maple street and the Rehnborg cottage near the Maplewood. Col. I. N. Lewis bought the Bodwell farm and it was his summer home for many years. He was the inventor of the Lewis Machine Gun.